This came when this town celebrated its annual fiesta with the longest boodle fight set in the municipal main thoroughfare in November 26. 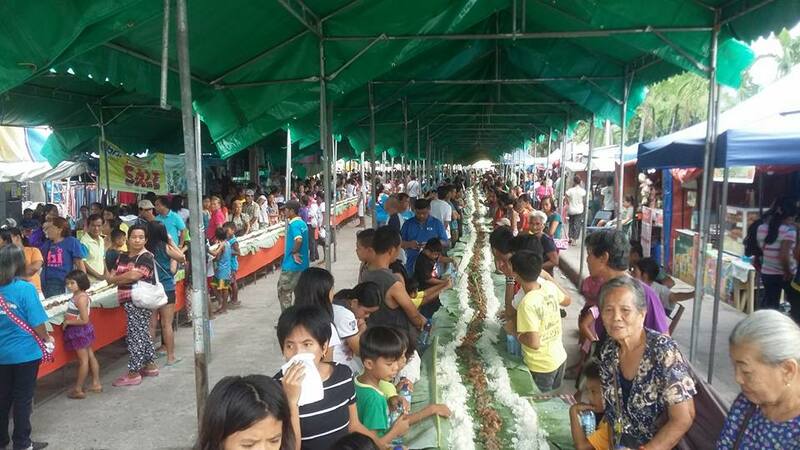 More than 7,000 people ate modest ‘handa’ of Dinuguan, Kilawin, and Menudo served on a 535-meter long tables. Boodle fight is a local army term when the personnel and officers eat together in the open in a long table and the food laid down on banana leaves. A total of 445 tables were lined-up along the main street of the town and all covered with banana leaves where the rice and viands were laid down in a stretch of 535 meters. All standing, the throng of people ate with their bare hands. Children, women, senior citizens, farmers, businessmen, barangay officials and Tanods enjoyed feast in the street. Hon. Eclar said it was his own money spent for the 2,500 kilos of pork and chicken meat and 12 cavans of rice. The 8,000 bottled water he said were, however, donated by the local mineral water businesses. He soft spoken Eclar is a multi-millionaire who made it big in the construction industry. An engineer, who he started his career as a “lowly” municipal employee of this 3rd class town back in 1986. When he resigned in 1998, he put up the MB. Eclar construction company which is now one of the biggest construction firm in the province of Tarlac. “Noon nakiki-kain lang ako kapag fiesta namin. Kaya ngayon na medyo natupad ko na aking mga pangarap, gusto ko naman na ako ang magpakain sa aking mga kababayan”, also said Eclar. Sought for comment, local resident Jimmy Ocampo said, Sana maging tradisyon na ito tuwing fiesta”.